The day of a dinner party can be a hectic time. Cleaning, baking, decorating and getting yourself ready are all very time-consuming. Relieve some of the stress and make your main dinner dish ahead of time. Lasagna is the perfect choice. It is a favorite meal of many people and all the ingredients can be cooked and prepared the day before the party. On the day of the party, all you need to do is throw it in the oven and voila! You have a fresh lasagna for your guests to enjoy. 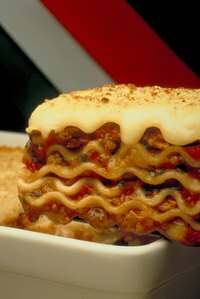 Prepare your lasagna the day before the party using your preferred recipe, but do not bake it. You must, though, cook the meats and vegetables if applicable. Consider using no-boil noodles to make it a simpler process. Place the lasagna uncovered in the refrigerator for about 30 minutes to give the cooked ingredients time to cool down, if necessary. You should not let hot foods cool down at room temperature before refrigerating. Cover the lasagna with foil or with a lid if the dish has a fitted lid. Keep the lasagna in the refrigerator overnight. Take the lasagna out of the fridge about 90 to 100 minutes before you want to serve it, depending on the recipe’s cooking time. Allow it to sit uncovered for about 20 to 30 minutes before baking it. Preheat the oven and bake the lasagna as directed in the recipe. If you bake the lasagna straight from the refrigerator, it might take an extra five to 10 minutes to heat and bake it all the way through.